SW Piano Movers are based in SE19, South London, and offer a skilled piano disposal service in London and South East England. Yes, we can safely extract, remove and dispose of your piano at a licensed waste site, where as trade waste, it will incur a tipping charge. No, we never buy old pianos nor remove them free of charge. We are not piano dealers and we cannot rehome old pianos. You will be ready for our service when you have determined that your piano has reached the end of its useful life or you cannot find a new home for it. Although your piano may have reached the end, extracting and disposing of it will require care so as not to damage your home, floors or fittings. Please call us to discuss it! 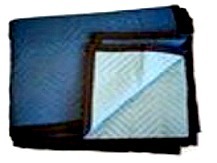 1) Quilted moving pads (padded blankets) protect carpets, floors, stairs and brick steps - as well as pianos. 2) If needed, boards over floor tiles laid over wooden floorboards. 3) Blocks and ramps to avoid contact with vulnerable plastic double glazed thresholds. 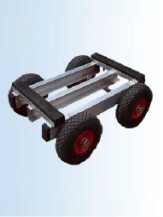 4) Weight spreading wide profile piano trolley wheels. We specialise in moving upright and grand pianos, and can carefully remove your unwanted piano and take it to a proper licensed facility. As the law requires, we are registered with the environment agency and hold a waste carriers licence. We are 'piano movers' rather than 'waste carriers' in the way the public may understand the phrase. However in order to handle and dispose of your unwanted piano, we must be registered with The Environment Agency. 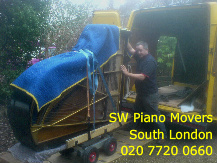 SW Piano Movers offer a skilled piano delivery and manoeuvring service to the public in London and South East England. We handle upright and grand pianos and pianolas up to 6.5 feet in length. Deliver to all areas of the UK and can quote for European deliveries. Work at weekends, which we find convenient for people who cannot be available during weekdays.